How do you improve a day grilling hamburgers and hotdogs? Easy, just add pig. 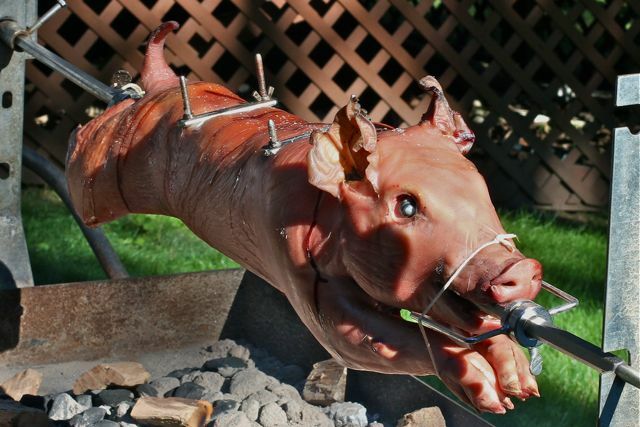 30 pounds of pig on a spit to be exact! This was our first pig roast so we decided to start small, and 30 pounds is really small (for a pig). After some research, I found a good guide from J. Kenji Lopez-Alt, who I respect from his work with Cook’s Illustrated and Serious Eats. We’ll add to the oxymoron here and season the pig with kosher salt, and a little Blue Moon beer. We roasted Cap’n Squeal over coals and hickory chips for about 4 hours. 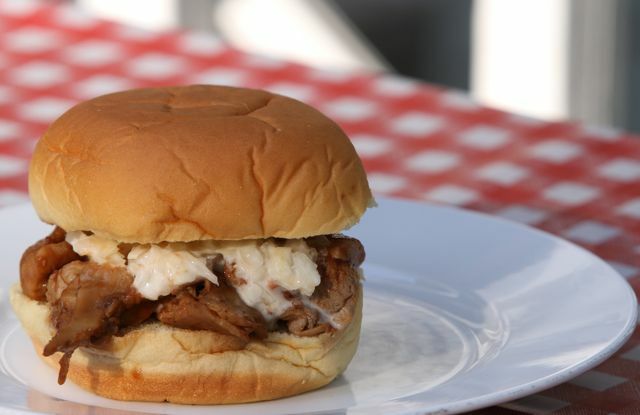 The pig was efficiently cut up on my convenient 5 foot long cutting board, shredded and placed onto a soft potato roll with Frank’s special BBQ sauce and some cole slaw. You may remember Frank from Episode 4, he makes a killer sauce. A little cornbread and baked beans on the side, and I’m in heaven. The skin was crisped up a little more on the grill, and as soon as I put it on the table it disappeared. I’m no scientist, but I think it evaporated. 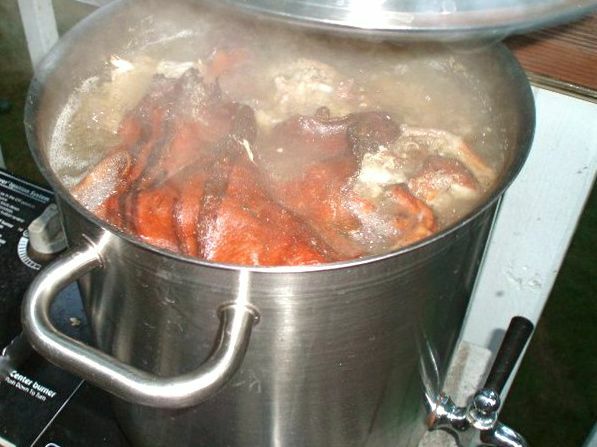 The rest of the carcass (head, hooves, tail, backbone) was boiled and made into a gallon of pork stock which will be used for bean soup or my pasta and chick pea recipe (coming soon to a blog near you). Duuude, have you been to Porkstock? It’s tough to eat something with a face. We felt bad for the little piggy, but nothing was wasted. We used everything but the oink. So, would we do it again? Abso-f’n-lutely! Next time we’ll go with a larger pig and cut out the burgers and dogs. To finish things off, we made a bonfire and roasted marshmallows. Note to self: Even in limited quantities gasoline is not an adequate replacement for lighter fluid. Don’t try this at home kids. PS. 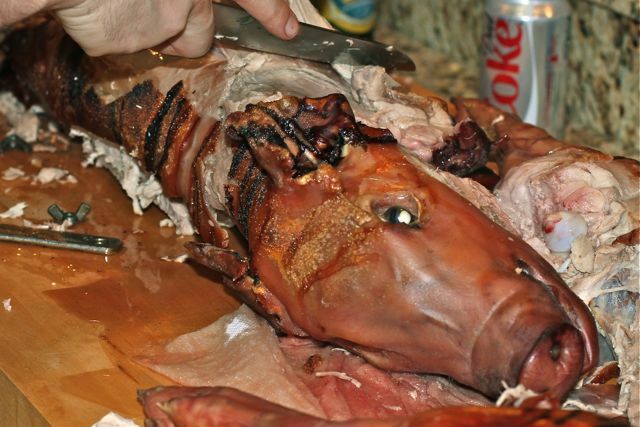 I love pig and all, but this picture may give me nightmares! Good thing he didn’t have tusks. Holy pig! What an awesome evening to spend with friends. Tell me the truth didn’t the face on the pig while grilling kind of freak you out? I know the roasted pig meat was sinfully delicious. The cupcakes were adorable too. 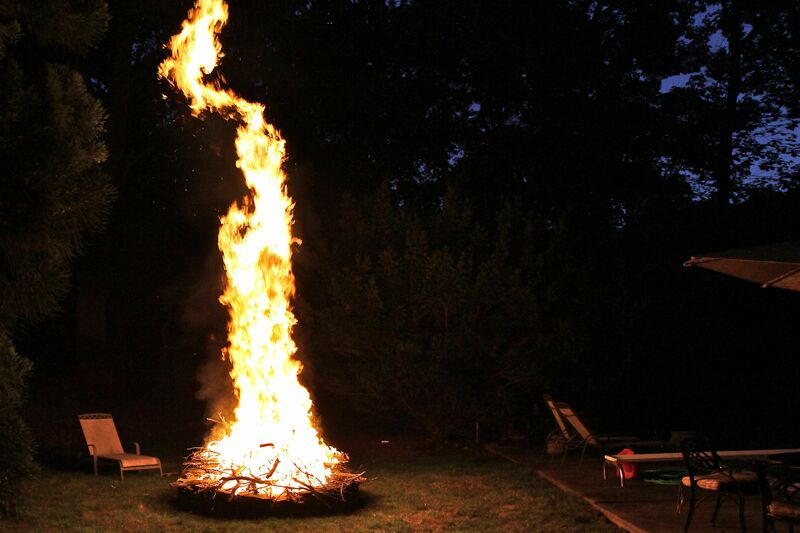 The bon fire, cool but, the flames!!! Do your comments appear automatically or wait to be moderated? I left a comment but, I don’t see it. Hmmm. Let me try again. Holy pig! That was awesome. tell me the truth did the pig face staring at you on grill freak you out? probably not, would me. No doubt that the grilled pork meat was delicious. The kosher salt being added to season the pork made me smile. The cupcakes were adorable and the bonfire, well the sky high flames were enough to cause your neighbors to be concerned. A fabulous evening shared by all! I do moderate the comments — but I haven’t had to surpress or censor any so far (lucky, I guess). The piggy face did freak us out a bit, but once the pulled pork was served everyone seemed to forget their concerns! I left – rather, we did, for Paris on July 11th and are now in Belgrade – home next week. I have been counting on you to keep me up to date!!!! Look at all I have missed. I am just today taking some time to catch up on my readings and assumed you hadn’t posted anything all summer and was just going to drop by and tell you to pop by my site. I have 2 Paris posts yet to come and then some interesting ones (sausage making) etc from Bosnia… but look at you! You have written a ton! Please keep me informed. I count on it. Pig roasts are on every other corner in the Balkans and such a novelty at home, aren’t they? It looks like a fairly lovely pig. What kind was it… let me read the post again. I have a pig roast post to post from our trip, too. I also have two on the blog… love them. And they are such an intimate part of Vanja’s culture. What fun for you…. and I see I have missed so many posts. A lot of reading. I will probably catch up sometime tomorrow. 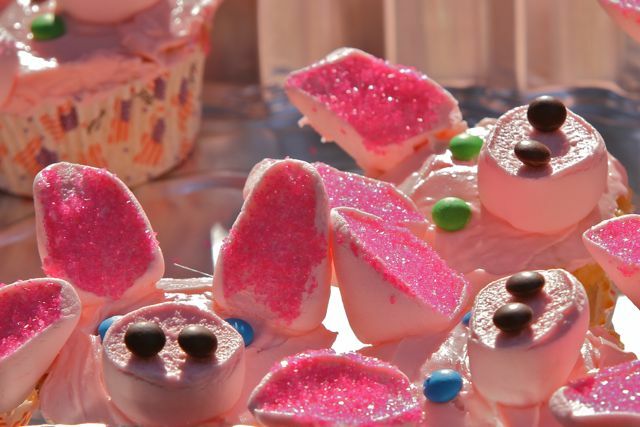 Love the cupcakes, too… so you didn’t brine it first? That is essential for a good pig roast, I think. We always do that. I will ask Vanja how. I forget. I think you were lucky to get a little fella they are so lovely and tender. How many of you were there? Next time, just have less people (hehe). The ears usually go first. Vanja just walked in. You rub salt inside and outside of the pig – a couple of handfuls and then roast it. I guess that is it. But it is important. Val, we did do the salt rub. I also marinated myself and the pig in a little beer 🙂 Next year we need to roast something that would be more difficult to make into cupcakes! Wildebeest maybe? If I give you my first born will you be my friend? 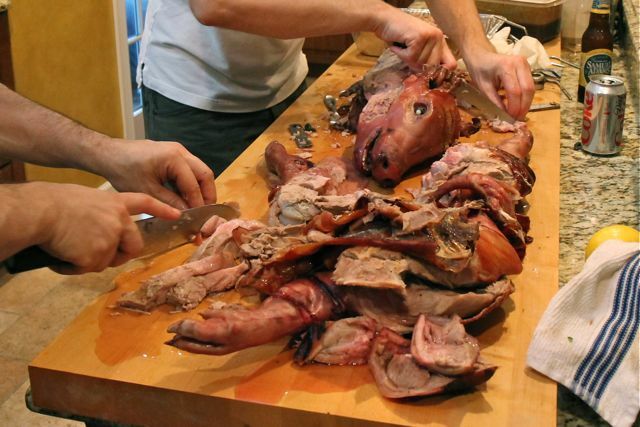 And just so I am honest with you: I really just want to be invited to the NEXT pig-roasting party! It won’t take your first born, just some imaginative plate of food to get you invited to the pig roast! 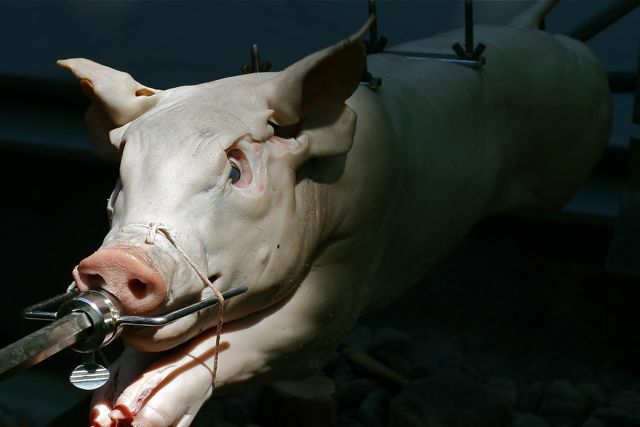 That pig looks surreal……………What courage. It looks good too. Surreal in a Tim Burton kinda way 🙂 Thanks for stopping by Kitchen Butterfly!